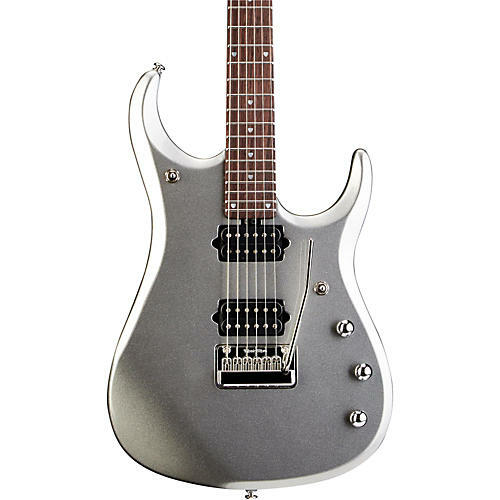 The Music Man JP13 John Petrucci 6-String Electric Guitar is the latest update to an already great guitar. It benefits from some key improvements including a preamp circuit and a solo boost. Dual DiMarzio Custom Wound JP13 Pickups and a Piezo bridge pickup provide an expanded range of tones. The humbuckers are wired to a 3-way switch and push/push coil tap via the Tone knob. The Volume knob is also push/push to activate the gain boost, which has its own trim pot. A seperate Piezo volume control with pots for Mix, Bass and Treble lets you dial in just the right amount of acoustic sounds. Two output jacks for the magnetic and piezo pickups offer the choice of a combined mono or stereo signals. The JP13 has a sleek basswood body with a maple top and mahogany tone block. The bolt-on mahogany neck is ultrafast with a rosewood fingerboard and 17" neck radius. It has 24 medium jumbo stainless steel frets and JP13 inlays. Schaller tuners and a Custom John Petrucci Music Man Piezo floating tremolo add to the list of features. As John himself puts it: "I'm incredibly proud to debut my new JP13 signature Music Man guitar! Through experimentation while on the stage and in the studio, revelations both sonically and as they pertain to design have allowed me and the gifted team at MM to update and improve the features of the JP over the years. The 13 marks the first time a preamp circuit has been introduced in this guitar along with a solo boost conveniently accessed from the volume knob. The enhanced tonal range and openness is noticeable and welcomed from the moment you plug it in. I hope that anyone who plays the new JP13 enjoys it as much as I do, and with these new features I'm pretty confident that you will!" Includes case.